The following are some core standards for formatting University-level essays and similar types of work in my classes. Not all apply to all types of work (for example, blogs, unessays, or in-class writing assignments). Feel free to ask if you think your work requires something different. Most of these requirements will be shared by other instructors, especially in English; if you are not told otherwise by an instructor, you probably won’t get in trouble following these guidelines. Whenever I am aware that there are differences of opinion among instructors (or that different types of assignments might require very different formatting, I have indicated this). Your essay should be American Letter (8.5” x 11”) format, printed “portrait” orientation (i.e. the normal way of printing paper so that the page is longer than it is wide). Staple your pages together in the top left corner using a single staple. _Do not use a binder, “duo tang,” or any other kind of cover. Letter-Sized paper is a North American standard. If you are required to submit your work on paper, you may find that your instructor wants you to print double-sided in order to save paper—though most will still require single-sided printing as this is much easier to grade. A few instructors may ask you to join your pages together with a staple: but staples are far more normal. Set your margins (all sides) to 5 cm (2”). Most instructors will probably specify 3cm or 1.5”. I prefer a wider margin as it gives me more space for comments. Use a 12 point serif-style (i.e. Roman-style) font: examples include, Times, Roman, Times New Roman, Garamond, Bitstream Charter. Don’t use a sans-serif-style font (e.g. Arial). This is standard for most instructors. If your instructor specified something else, however, make sure you do what they ask: they may require a different type-face or font size due to difficulties with their eyesight. Never use a font smaller or larger than 12pt unless you are told to. Double-space all text including quotations and bibliography. This is standard for most instructors. Unless I tell you otherwise, do not put your name anywhere on the body of your essay. If you are submitting your essay electronically, your name is automatically recorded with the submission so you do not need to record it anywhere in your paper. If I ask you to hand in your paper in hard copy, you should put your name on a separate title page. I ask for this because I like to mark essays “blind” (i.e. without knowing the author’s name until I am finished). Instructors differ greatly on what they prefer in this area. Some prefer last name on every page; some prefer your name name, class, date, etc. at the top of the first page of your main body. You should ask your instructor what they prefer if you are in doubt. In this style, the first line of each new paragraph is indented about 5 spaces or one tab from the left hand margin. 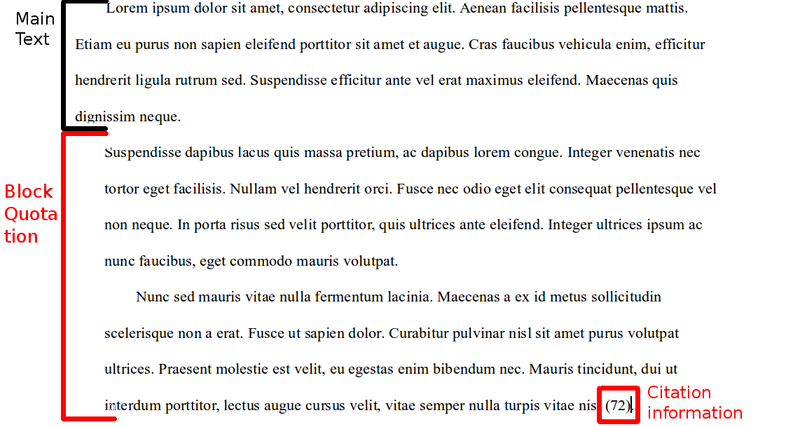 Not that paragraphs are not separated by a blank line (blank lines should be used only in longer essays to separate longer sections). Most instructors will want you to use indented style. 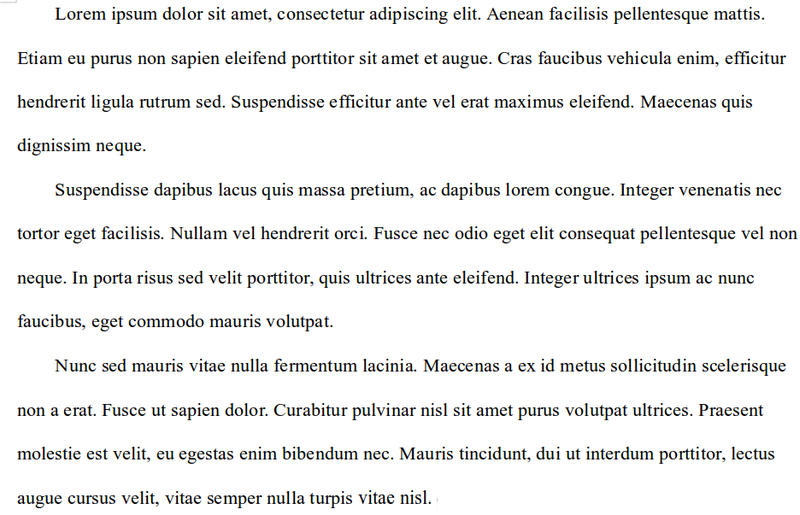 The most common mistake students make with this style is putting blank lines between paragraphs. Unless your instructor explicitly tells you otherwise, you should never use “block style” paragraphs: i.e. paragraphs that are separated by a blank-line only (as is the case on most websites). Quotations of two lines or less should be distinguished from the surrounding text by quotation marks. Do not use italics for quotations unless the quotation is in italics in the work you are quoting. If you are providing a parenthetical citation, final punctuation goes after the citation. If there is no parenthetical citation, then North American style places commas (,), periods (. ), question marks (? ), and exclamation marks (!) inside the quotation marks, even if they are not found in the source. Colons (:), semi-colons (;), and dashes (—), on the other hand, go outside, even if they are from the original. Using quotation marks and italics (you should only use italics if they are found in the source). Putting commas and periods outside the quotation marks when no parenthetical citation is used (everybody is aware that the North American convention doesn’t make sense). Putting punctuation before parenthetical citations. Not putting a space between the closing quotation mark and the parenthetical citation (if present). Most instructors will require you to format inline quotations this way. Block quotations of poetry reproduce the line division of the original poem. Block quotations from prose sources do reproduce the original line division. Centering rather than indenting block quotations. Using quotation marks at the begining and end (Block Quotations do not use quotation marks unless the quotation marks are found in the original). Putting the quotation in italics (italics should only be used if they are found in the original). Most instructors will require you to format your block quotations like this. The main difference is how long a quotation should be before they require you to put it in block format. Most people will say 3 or more lines of poetry or 30 or 40 words of prose. In my classes, please use either Chicago Author-Date or MLA “in-text” (Chicago Author-Date is the more common in my research sub-disciplines; but MLA is common elsewhere in literary studies and is the department standard). Do not use footnotes for bibliography in my classes. Documentation styles vary widely by discipline. Ask your instructor what to use if you are unsure. But above all, get yourself a citation manager. Citation managers take all the guesswork out of citation: they automatically format citations according to different styles and you can change them from one paper to the next. Class 2.0: Digital technology & digital rhetorics in the undergraduate classroom. I just posted the slides for my lecture to the Department yesterday: Class 2.0: Digital technology & digital rhetorics in the undergraduate classroom. Abstract: This lecture discusses some preliminary results from an ongoing research project on the use of digital technology and digital rhetorics in the undergraduate classroom. The goal of the project is to explore how these technologies and rhetorics can address common problems in the literature classroom: weak composition skills, lack of engagement, poor preparation. Initial, at this point still largely anecdotal, results suggest that the committed integration Web 2.0 technologies and rhetorics in the classroom can greatly improve outcomes in this area. The lecture discusses how these techniques are used and some of the results we have seen. The essay is a wonderful and flexible tool for engaging with a topic intellectually. It is a very free format that can be turned to discuss any topic—works of literature, of course, but also autobiography, science, entertainment, history, and government, politics, and so on. There is often something provisional about the essay (its name comes from French essai, meaning a trial), and almost always something personal. In some countries (e.g., the United States and Canada), essays have become a major part of formal education. Secondary students are taught structured essay formats to improve their writing skills, and admission essays are often used by universities in selecting applicants and, in the humanities and social sciences, as a way of assessing the performance of students during final exams. One result of this is that the essay form, which should be extremely free and flexible, is instead often presented as a static and rule-bound monster that students must master in order not to lose marks (for a vigorous defence of the flexible essay, see software developer Paul Graham’s blog). Far from an opportunity to explore intellectual passions and interests in a personal style, the essay is transformed into a formulaic method for discussing set topics in five paragraphs: the compulsory figures of academia. The unessay is an assignment that attempts to undo the damage done by this approach to teaching writing. It works by throwing out all the rules you have learned about essay writing in the course of your primary, secondary, and post secondary education and asks you to focus instead solely on your intellectual interests and passions. In an unessay you choose your own topic, present it any way you please, and are evaluated on how compelling and effective you are. The unessay allows you to write about anything you want provided you are able to associate your topic with the subject matter of the course and unit we are working on. You can take any approach; you can use as few or as many resources as you wish; you can cite the Wikipedia. The only requirements are that your treatment of the topic be compelling and effective: that is to say presented in a way that leaves the reader thinking that you are being accurate, interesting, and as complete and/or convincing as your subject allows. There are also no formal requirements. Your essay can be written in five paragraphs, or three, or twenty-six. If you decide you need to cite something, you can do that anyway you want. If you want to use lists, use lists. If you want to write in the first person, write in the first person. If you prefer to present the whole thing as a video, present it as a video. Use slang. Or don’t. Sentence fragments if you think that would be effective. In other words, in an unessay you have complete freedom of form: you can use whatever style of writing, presentation, citation,… even media you want. What is important is that the format and presentation you do use helps rather than hinders your explanation of the topic. If unessays can be about anything and there are no restrictions on format and presentation, how are they graded? The main criterion is how well it all fits together. That is to say, how compelling and effective your work is. it is attractive (i.e. it is presented in a way that leads the audience to trust the author and his or her arguments, examples, and conclusions). The unessay may be quite different from what you are used to doing in English class. If so, a reasonable question might be whether I am wasting your time by assigning them. If you can write whatever you want and present it any way you wish, is this not going to be a lot easier to do than an “actual” essay (though remember, the compositions you usually are asked to do in class are actually far less “real” examples of the genre as it is used professionally than are your unessays)? And is it not leaving you unprepared for subsequent instructors who want you to write the “real” kind of essays? The answer to both these questions is no. Unessays are not going to be easier than “real” essays. They have fewer rules to remember and worry about violating (actually there are none). But unessays are more challenging in that you need to make your own decisions about what you are going to discuss and how you are going to discuss it. And you are not going to be left unprepared for instructors who assign “real” essays. Questions like how to format your page or prepare a works-cited list (i.e. the kind of thing many students obsess about in such classes) are actually quite trivial and easily learned. You can look them up when you need to know them (that’s what I do, anyway). Increasingly, you can get your software to handle these things for you (ditto). In our class, moreover, I will be giving you separate instruction on what English professors normally expect to see in the essays you submit to them. But even more importantly, the things you will be doing in an unessay will help improve your “real” ones: excellent “real” essays also match form to topic and are about things you are interested in; if you learn how to write compelling and effective unessays, you’ll find it a lot easier to do well in your “real” essays. But more importantly, you might find yourself writing real “real” essays (i.e. essays that are true to the experimental and personal origins of the genre) instead. Given a choice, most instructors would rather read those kinds of papers anyway. Last modified: Thursday April 25, 2019. 19:47.